MBBS, DO, DNB, FRCS (Glasgow), FICO (USA), MNAMS, MBA (Healthcare Management, Vanderbilt University, USA), Fellow of American College of Surgeons, is one of the leading Facial Plastic, Oculoplastic (Ophthalmic Plastic) & Cosmetic Surgeons in the world, based in Mumbai, India currently. Dr. Shome also acquired a MBA (Healthcare Management) from Vanderbilt University (USA) & National University of Singapore in 2008. Dr. Debraj Shome is the Co-Founder and Director of The Esthetic Clinics, a chain of top class dermatology, plastic surgery & cosmetic surgery centers located at Mumbai, Hyderabad, Kolkata & New Delhi in India. He is presently attached to many multi-specialty hospitals including Breach Candy Hospital (Breach Candy, Mumbai, India), Saifee Hospital (Girgaon, Mumbai, India), Apollo Spectra Hospital (Chembur, Mumbai, India), S L Raheja Fortis Hospital (Mahim, Mumbai, India) & Parkview Specialty Hospital, Kolkata, India. 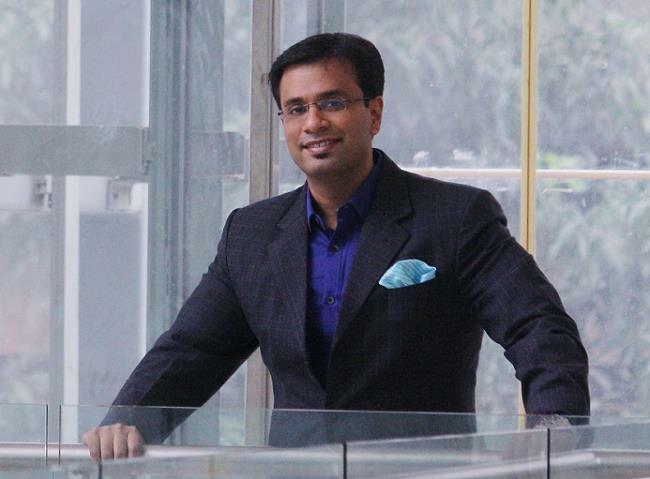 He is the head of the Facial Plastic Surgery center at Apollo Spectra Hospital, Chembur, Mumbai, India. This is one of the topmost centers catering to ultra-superspecialty surgery in India. He was the co-founder of The Esthetic Clinics at Apollo Health City, Hyderabad, and had been the Head of the Department of Facial Plastic & Cosmetic Surgery there from 2009-2011. Dr. Shome is an acclaimed Facial Plastic Surgeon & Oculoplastic Surgeon, who specializes in facial cosmetic & reconstructive surgery, Oculoplastic surgery, ocular & facial cancers, orbital, lacrimal & socket surgery. Dr. Debraj Shome has won many citations and honors such as “Best Plastic Surgeon in India (2015)”, “Best Cosmetic Surgeon in India (2016)”, “Best Facial plastic Surgeon in India (2018)”, “Marquis Who’s Who”, “Indian of the Year (2017)”, “Marquis Who’s Who Asia Pacific” etc. 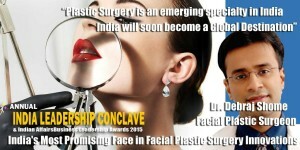 Facial Plastic Surgery is a burgeoning super-specialty in India, but is quite in demand in the USA currently. Currently majority of the facial surgeries in the US are performed by this particular group of plastic surgeons, who are super-specialized in surgeries of the lacrimal, orbital, facial & peri-ocular tissues. As these surgeons have been trained specifically in plastic surgery of the tissues of the face & practice exclusively in the face, end results in all facial surgeries tend to be better than general plastic surgeons who operate all over the body. Pharma Leaders presented their annual Power Brand Awards 2015 on December 30th 2015, in Mumbai, India, felicitating Dr. Debraj Shome as a ‘Breakthrough Innovator in Facial Plastic Surgery’. This prestigious award was presented in association with the Ministry of Health & Family Affairs, Department of Pharmaceuticals and the Ministry of Chemicals & Fertilizers (Government of India). Dr. Debraj Shome was honored for his continued excellence in making the art and science of plastic surgery & cosmetic surgery progress in India and making Mumbai one of the leading destinations for aesthetic medicine & surgery in India & world over. Dr. Debraj Shome was awarded as the ‘Best Plastic Surgeon in India’ for 2015, by Shri Shripad Yesso Naik, Honorable Union Minister of Health & Family Welfare (Govt of India) & Dr. C P Thakur, MP & Former Union Govt of India Cabinet Minister, at the Healthcare Excellence Summit & Awards 2015, on 9th December 2015, at Hotel Radisson Blu, New Delhi. The award was announced by the Worldwide Achievers group to Dr. Shome for his excellence in facial plastic surgery and for pushing the frontiers of plastic surgery in India to amongst the world. Dr. Debraj Shome, Top Facial Plastic Surgeon, India, was also awarded as the ‘Most promising face in Facial Plastic Surgery’ by the Network 7 Media group ( www.network7mediagroup.net ) and Chairman Mr. Satya Brahma, in August 2015. 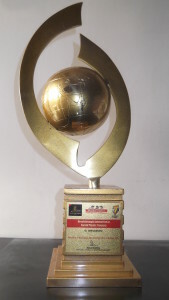 This award is to be given at the 6th Annual Leadership Conclave & Indian Affairs Business Leadership Awards 2015 ( www.ilc2015.in ), in August 2015, for his excellence in plastic surgery and getting the best of plastic surgery from all over the world to India. Dr. Debraj Shome acquired his undergraduate medical degree from Grant Medical College and Sir J.J. Group of Hospitals, Mumbai; one of India’s oldest medical schools. Thereafter, he went ahead to specialize in ophthalmology and completed his residency from Sankara Nethralaya, Chennai. He obtained the degrees of F.R.C.S. (Fellow of Royal College of Physicians and Surgeons of Glasgow) in 2003 and also his Diplomate of National Board (D.N.B.) in 2004. Dr. Shome then studied extensively and acquired specialization degree in Orbital surgery, Ocular Oncology & Ophthalmic Plastic Surgery in an elaborate fellowship from L.V. Prasad Eye Institute, Hyderabad, India, 2005. Dr. Shome subsequently completed an esteemed clinical fellowship in Cosmetic Facial Plastic surgery from one of the world’s top centers at Salt Lake City, USA. Following that, Dr. Shome completed another clinical Fellowship in Head & Neck Surgery from the Department of Head & Neck Surgery at the M D Anderson Cancer Center in 2007. This fellowship, prepared Dr. Debraj Shome to specialize in multi-disciplinary approaches to Head & Neck Oncology. In 2015, Dr. Shome completed another esteemed and prestigious fellowship in Cranio-Maxillo-Facial Surgery, from Morriston Hospital, Wales, UK – This fellowship was awarded by AOCMF, the world wide body for CMF & is awarded to only five surgeons globally, every year. This makes Dr. Shome truly distinctive as he has been trained independently and exclusively at the best / top centers in ophthalmology (eye surgery), plastic reconstructive & cosmetic surgery of the face & peri-ocular area & oculoplastic surgery. Dr. Shome also completed his MBA (Masters of Business Administration) in Healthcare Management in November 2008, from one of the world’s top business schools in the USA. Such a remarkable coalition of top-class health and clinical practice skill sets enables Dr. Shome to develop and lead teams to make the best possible centers, as a man manager, an administrator and a surgeon. Dr. Debraj Shome founded The Esthetic Clinics at Apollo Hospitals Hyderabad, now situated at multiple city locations in India (Mumbai, Hyderabad, Kolkata & New Delhi). Dr. Debraj Shome has won numerous rewards and honors in his career till date. He has more than 50 international peer reviewed research papers published in top-line international scientific journals, chapters in international books and has given numerous presentations in ophthalmology conferences, head & neck conferences, oculoplasty meetings, ENT conferences, Reconstructive Surgery meets, Facial Plastic Surgery Conferences, Plastic Surgery symposiums, and Cosmetology conferences all over the world; thus, Dr. Shome is a trailblazer who not only practices the best in medicine but also conducts research that modify practice patterns and make up the ‘medicine of tomorrow’. Dr. Shome has invented multiple drug molecules as well. The first drug invention was that of nano-molecule carboplatin, a drug used to treat facial & ocular cancers. Dr. Shome has also invented the revolutionary QR 678 hair growth factor injections, which has been awarded a USA patent from the United States Patent & Trademark Office in 2017. Because of his academic and scientific pursuits in the field of Facial Plastic Surgery & Facial Cosmetic Surgery, Dr. Shome has been awarded as emeritus “Professor in Facial Plastic Surgery” by the Apollo Hospitals group, in 2017, the first such in the group. Dr. Shome is currently a faculty member at two of the world’s top facial plastic surgery and rhinoplasty cadaveric dissection courses, held at Vienna, Austria and San Francisco in the USA. The rhinoplasty course has been running triumphantly for 47 years in a row and Dr. Shome is revered to be an esteemed faculty at this course. Dr. Shome was the victor of the eminent Quiz Contest at the annual meeting of the All India Ophthalmological Society conference in 2006. For this approbation, he was felicitated by The President of India, His Excellency, The Honorable Dr. A. P. J. Abdul Kalam. Dr. Shome has also won the extremely acclaimed Colonel Rangachari award & the Hanumantha Reddy award at the annual meeting of the All India Ophthalmological Society Conference in 2010, for his far-reaching invention and paper on a nano-molecule of carboplatin (a cancer drug), that vows to alter the way facial, neural & eye cancers are treated. Dr. Debraj Shome is also one of the creators of the revolutionary QR 678 hair growth molecule. Dr. Debraj Shome was honored with the extremely lofty Davies Foundation Grant Award by the Royal College of Surgeons, Glasgow, United Kingdom in 2010. This Grant Award is bestowed on to only two outstanding physicians (best / leading doctors) from all over the world who have performed splendid work in cancer research and therapy, played a part in conducting life-saving research and have changed the entire pattern of cancer therapy in the world. This Grant Award established through the William and Elizabeth Davies Charitable Foundation awards an extremely prestigious Grant Award to assist a range of activities equipped for improving the management of cancer. Dr. Debraj Shome has been honored with session best prizes at the national annual scientific conferences in 2003, 2006, 2007, 2009 and 2010. Dr. Shome has been awarded a number of Best Researcher award grants by various organizations affiliated to the Government of India, including the Department of Biotechnology (DBT), the Department of Science & Technology (DST), the Council of Scientific & Industrial Research (CSIR) as well as private organizations such as the Sir Ratan Tata Trust. Dr. Shome was honored with the first ever Bharat Biotech – LVPEI Travel Grant award in 2005 for his research work. Dr. Debraj Shome was also the beneficiary of an extremely eminent Travelling Grant Fellowship Award from the Royal College of Surgeons, Glasgow for his work in Oncology research in 2005. He has been chosen as a reviewer (to review other peer surgeon’s research submissions) for the ‘Indian Journal of Ophthalmology’, the flagship journal of the All India Ophthalmological Society, ‘Ophthalmology’ – The primary Cosmetic journal of the world and ‘Head and Neck Surgery’ The American Academy of Ophthalmology flagship Journal, ‘Dermatologic Surgery’ and ‘Archives of Facial Plastic Surgery’ – The topmost journals in Facial Plastic Surgery in the world. A) Dr. Debraj Shome was awarded as the ‘Best Facial Plastic Surgeon in India’ by Goal, a renowned NGO in India, in July 2018. This award was for the philanthropic work done by Dr. Shome through the Debabrata Auro Foundation and for the national building work done by Dr. Shome. B) Dr. Debraj Shome was awarded as the “Indian of the Year” at the Healthcare Forum at the Indian Leadership Conclave in August 2017, for his invention of the QR 678 hair growth factor formulation, which received a USA patent from the United States Patent and Traddemark Office (USPTO) in 2017. C) Dr. Debraj Shome was awarded with the ‘Best Cosmetic Surgeon in India’ award at the extremely prestigious India’s Best Doctors Awards Ceremony held at New Delhi, on 24th September, 2016. India’s Best Doctors Awards (IBDA) have been instituted by Brands Impact to recognize the contributions of Healthcare Professionals & Companies towards strengthening India’s Healthcare Infrastructure. These awards were held at Radisson Blu Hotel in New Delhi, India on 24th September 2016. Revered Bollywood actor and TV personality, Mr. Shekhar Suman, graced the magnificent occasion as the Chief Guest. Top Bollywood film stars and politicians like Dr. Sanjay Singh, Raja of Amethi; Sri Acharya Sudarshan ji Maharaj; Mr. Pahlaj Nihalani, Chairman of CBFC; & Mr. Kirti Azad, Former MP & Indian Cricketer, graced the occasion. The Union Minister of State for Health & Family Welfare, Government of India, also graced the occasion. D) Dr. Debraj Shome was awarded the ‘Best Plastic Surgeon in India’ award at the extremely prestigious National Healthcare Excellence Awards 2016. The event was organised by CMO Asia and held at Hotel Taj Lands End, Mumbai, India, on 24th June 2016. The vision of CMO Asia is to share best global practices and give more space to the consumer voice. 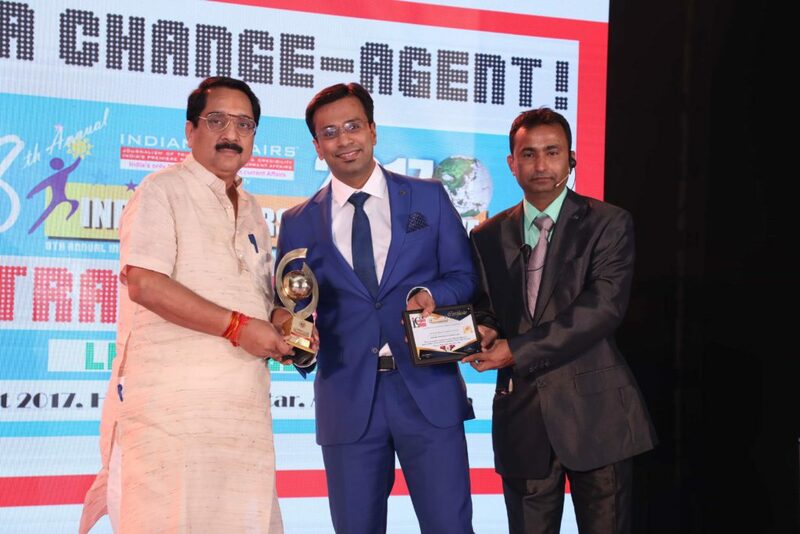 E) Dr. Debraj Shome Awarded As ‘Breakthrough Innovator In Facial Plastic Surgery” At Annual Power Brand Awards, 2015. 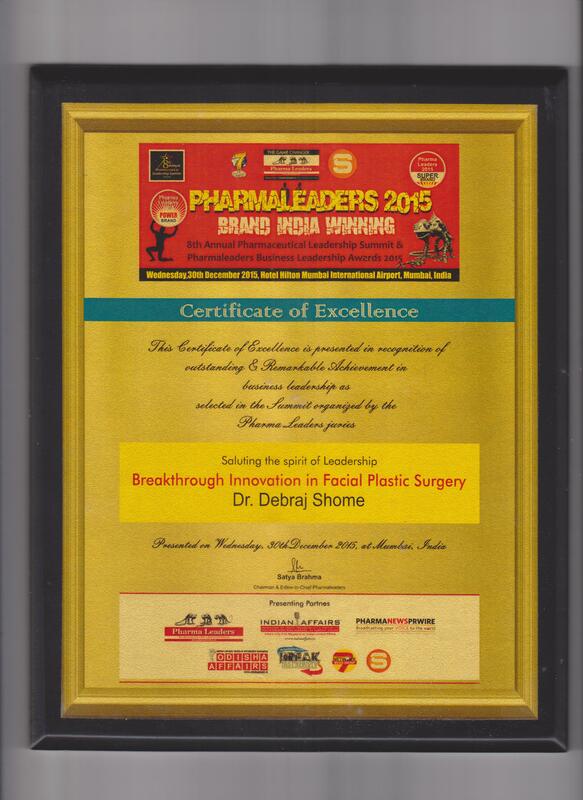 Pharma Leaders accorded their annual Power Brand Awards 2015 on December 30’ 15, in Mumbai, India, congratulation Dr. Debraj Shome as a ‘Breakthrough Innovator in Facial Plastic Surgery’. This esteem award was presented in association with the Ministry of Health & Family Affairs, Department of Pharmaceuticals and the Ministry of Chemicals & Fertilizers (Government of India). Dr. Debraj Shome was privileged for his continuous distinction in making the art and science of plastic surgery & cosmetic surgery progress in India and establishing Mumbai one of the eminent destinations for aesthetic medicine & surgery in India & world over. 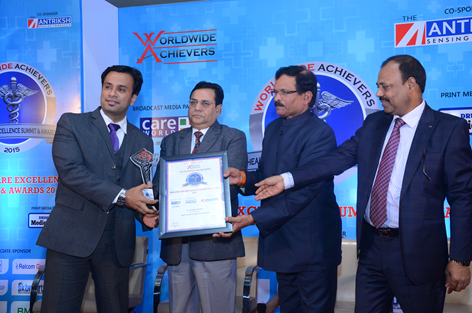 F) Dr. Debraj Shome was awarded as the ‘Best Plastic Surgeon in India’ for 2015, at the hands of Shri Shripad Yesso Naik, Honourable Union Minister of Health & Family Welfare (Govt of India) & Dr. C P Thakur, MP & Former Union Govt of India Cabinet Minister, at the Healthcare Excellence Summit & Awards 2015, on 9th December 2015, at Hotel Radisson Blu, New Delhi. The award was announced by the Worldwide Achievers group. G) Dr. Debraj Shome was awarded As “India’s Most Promising Face In Facial Plastic Surgery Innovations” At India Leadership Conclave POWER BRAND 2015, organised by the Network 7 Media group ( www.network7mediagroup.net ). This award was bestowed at the 6th Annual Leadership Conclave & Indian Affairs Business Leadership Awards 2015 ( www.ilc2015.in ), in August 2015. 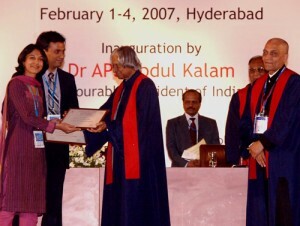 H) Awarded the extremely prestigious Colonel Rangachari Gold Medal Award for the year 2010 at the Annual Conference of the All India Ophthalmological Society meeting held at Kolkata in January 2010. The Colonel Rangachari Gold medal Award is awarded for the best research conducted in India during the previous calendar year and is awarded to Best Paper read at the Special Plenary Session of the annual conference of India’s national ophthalmological society. This award can be won by an individual only once in a lifetime. The awards was presented to Dr. Debraj Shome for presenting the revolutionary paper “Non Albumin Containing Nano Molecule of Carboplatin in an Adjunctive Role in Retinoblastoma”. 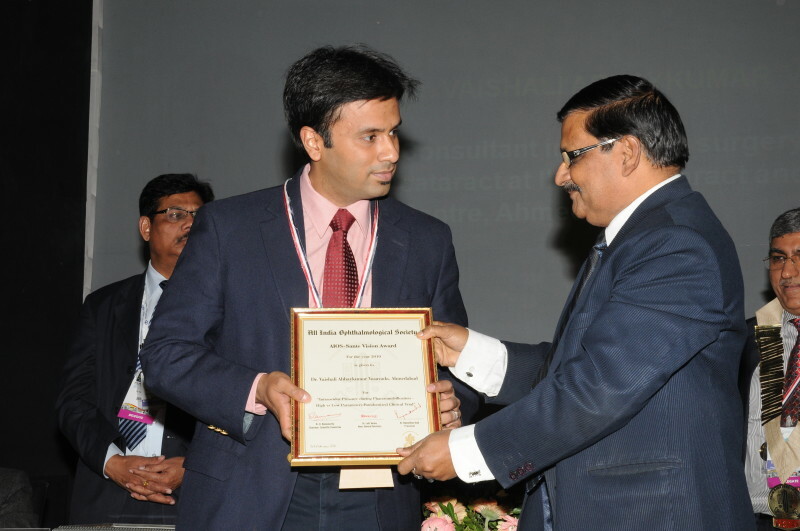 I) Awarded the extremely prestigious Hanumantha Reddy Award for the year 2010 at the Annual Conference of the All India Ophthalmological Society meeting held at Kolkata in January. The Hanumantha Reddy Award is awarded for the Best Paper presented at the annual conference of the Society in the Pediatric Ophthalmology (Child eye diseases). This award is given only once in two years and is awarded for the best research conducted in India during the previous calendar year in Children’s diseases and is awarded to Best Paper read at the Special Plenary Session of the annual conference of India’s national ophthalmological society. The awards were presented to Dr. Debraj Shome for presenting the revolutionary paper “Non Albumin Containing Nano Molecule of Carboplatin in an Adjunctive Role in Retinoblastoma” . J) Awarded the extremely prestigious Davies Foundation Grant Award by the Royal College of Surgeons, Glasgow, United Kingdom in 2010. This Grant Award is awarded every two years, to only two outstanding physicians from over the globe, who have performed sterling work in cancer research and therapy, have contributed to life-saving research and have changed the entire paradigm of cancer therapy in the world. Dr. Debraj Shome is the youngest ever recipient of this Award world-over and the first person outside of the US and the UK to win this award. L) Awarded the extremely prestigious American Academy of Ophthalmology ‘Distinguished Contribution’ award in 2011. M) Listed on Wikipedia. One of very few Indian surgeons listed by Wikipedia. N) Won the best paper award in Pediatric session at All India Ophthalmological Society meeting, Kolkata, 2010 for paper “Non-albumin containing nano molecule of carboplatin in an adjunctive role in retinoblastoma”. O) Won the best paper award in Pediatric session at All India Ophthalmological Society meeting, Jaipur, 2009 for paper “Does a Nano-molecule of carboplatin injected peri-ocularly help in attaining higher intra-vitreal concentrations and what is the applicability to retinoblastoma with vitreous seeds”. P) Awarded the Fellowship of International Council of Ophthalmology post a sponsored (International Council of Ophthalmology Grant) fellowship in Reconstructive Facial Plastic Surgery at MD Anderson Cancer Center, Houston, TX, USA under Dr. Bita Esmaeli. Q) Awarded largest grant from Vanderbilt University, Nashville, TN, USA, to complete MBA in Management ($ 56000) in 2007. Vanderbilt University was the second highest ranked Healthcare MBA in 2007 in USA. R) Selected by Asia/Pacific Who’s Who to be a part of the ‘select-one’ personalities of Asia and the Pacific from Volume no V, in February 2004. Part of every volume since then till date. S) Won the best paper award in Pediatric session at All India Ophthalmological Society meeting, Hyderabad, 2007 for paper “Periocular carboplatin in advanced Intraocular Retinoblastoma”. T) Winner of the Best Video award for video on “Myoconjunctival enucleation” at the American Academy of Ophthalmology conference, Las Vegas, November 2006. U) Reviewer for Indian Journal of Ophthalmology for Oculoplasty and Ocular Oncology. V) i)Reviewer for Ophthalmology for Oculoplasty and Ocular Oncology. ii) Reviewer for American Journal of Ophthalmology for Oculo – Facial Plastic Surgery, Oculoplasty and Ocular Oncology. iii) Reviewer for Dermatologic Surgery for Facial Plastic Surgery. W) Winner of the All India Ophthalmological Society Annual Quiz, Bhopal, 2006. X) Won the best paper award in Orbit session at All India Ophthalmological Society meeting, Bhopal, 2006 for paper “Implant and Prosthetic Motility Following Enucleation”. Y) Won the best paper award in Inflammation session at All India Ophthalmological Society meeting, Bhopal, 2006 for paper “Orbital And Adnexal Tuberculosis – A Retrospective Review of Seven Cases”. Z) Selected for a Travelling Fellowship grant to the United Kingdom by the Royal College of Surgeons, Glasgow. Utilized the same for visiting Moorfields Eye Hospital, London for a three-week-observorship from 3rd December 2005 to 23rd December 2005 in the Department of Ophthalmic Plastic Surgery under Mr Richard Collin and Mr Geoffrey Rose. Z1) Selected for a Young Scientist and Researcher Travelling Grant Award from the Department of Science and Technology, Government of India, for the purposes of presenting research at the American Academy of Ophthalmology annual meeting at Chicago, Illinois, October 2005. Z2) Selected for a Young Scientist and Researcher Travelling Grant Award from the Council of Scientific and Industrial Research, Government of India, for the purposes of presenting research at the American Academy of Ophthalmology annual meeting at Chicago, Illinois, October 2005. Z3) Awarded the Bharat Biotech – L V Prasad Eye Institute Travel Grant Award for the purposes of presenting research at the American Academy of Ophthalmology annual meeting at Chicago, Illinois, October 2005. Z4) Awarded the Sir Ratan Tata Trust Young Researchers Award for the purposes of presenting research at the American Academy of Ophthalmology annual meeting at Chicago, Illinois, October 2005 and to visit various top-line ophthalmic plastic practices in the United States of America. Z5) Won the best paper award in uvea session at All India Ophthalmological Society meeting, New Delhi, 2003 for paper “Intra-ocular tuberculosis – Clinical Profile, Systemic Correlation and Response to Anti-tubercular Therapy”. Z6) Awarded Distinguished Merit Scholarship of the National Scholarship Scheme in 1992. Dr. Debraj Shome has been appeared as an ‘Achiever’, by Express Health Care, a leading weekly healthcare publication by the Indian Express group, as early as 2007. Dr. Shome is appeared regularly in Hindustan Times, DNA – Daily News and Analysis, The Times of India, and many other leading English and regional language daily newspapers in India. He has published a lot of articles in the press on his work. 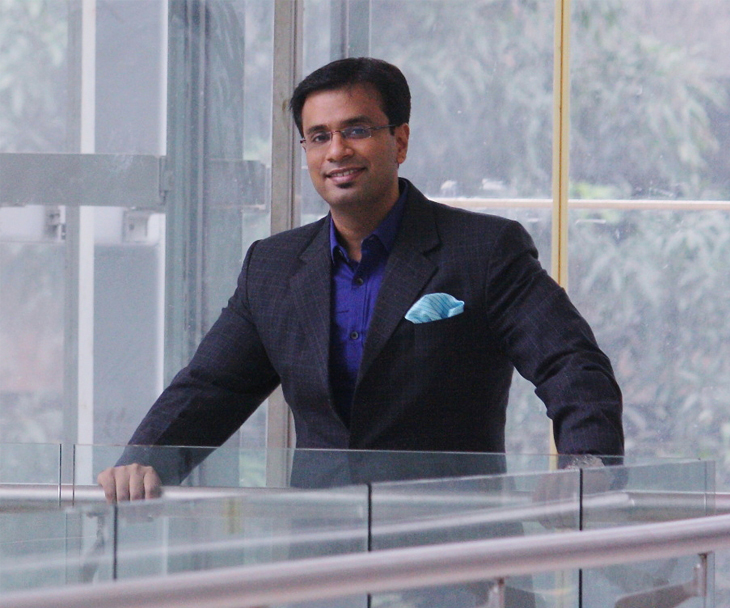 Dr. Shome tweets, regularly and writes didactic articles for the layman in magazine columns on a regular basis. For more information on Dr. Shome’s work, please click here.